He’s out thought us all. Getting just one puck from a player during warmup is a thrill for any young hockey fan. But a kid attending games at the World Junior Championship in Vancouver has thought of an ingenious way to score way more than that. 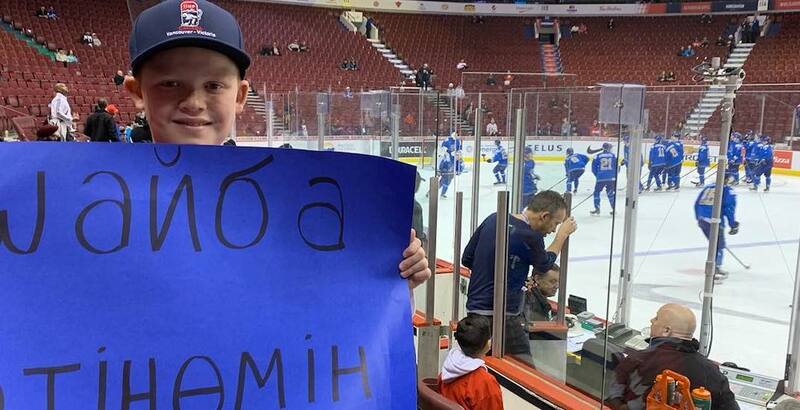 Armed with signs in multiple languages, this young boy has earned pucks from players from at least seven of the 10 competing countries in the tournament. Given that Sweden and USA have played all of their games in Victoria to this point, that’s an impressive feat. According to what we assume is his mother’s Instagram page, he’s scored 22 pucks so far, including one from each team at Friday morning’s relegation game between Kazakhstan and Denmark. The only country without photo evidence is the Czech Republic, but I’d be surprised if he didn’t score one from them too. Signs like “puck bitte,” which translates to “puck please” in German earned him a puck from Swiss forward Sven Leuenberger. He has similar signs, in the corresponding colours of each team, in Russian, Finnish, Slovak, Danish, and even Kazakh! The competition was stiff to get a puck from a Team Canada player, so the kid stepped up his game. “Watched you play at Gretzky/Hlinka!! Palet s’il vous plait,” got the attention of French Canadian forward Alexis Lafreniere. Thank you @leuenberger_sven for puck #8!! Just two days remain in the 2019 World Juniors. USA plays Russia Friday afternoon in one semi-final, while Finland takes on Switzerland in the other. The gold medal game is on Saturday night, with the bronze medal game taking place earlier in the day.